During the last few days, the country has been through almost all kinds of man-made and natural disasters. As if target killing on the streets of Karachi in the name of ethnic, political or personal rivalries and the military operation in the northern areas to wipe off the militants form the land of pure was not enough for the nation, nature unleashed at its worst upon the nation. On Wednesday 28th July, a Pakistani Airbus passenger plane of Airblue crashed in densely wooded Margalla hills of the capital Islamabad, killing up to 152 people on board, making it one of the country’s worst air crashes ever. On Thursday 29th July, Pakistani government declared a day of mourning and on that very day when the nation was offering silent prayers to the 152 ill-fated passengers of the Airblue flight ABQ-202, nature played havoc upon us, heavy rain and floods. The death toll from flash floods and landslides triggered by torrential monsoon rains in Pakistan rose to nearly 1600 on as officials reported thousands more displaced. Hundreds of homes and thousands of hectares (acres) of cultivated land have been destroyed in the northwest region. Entire villages have been wiped out and infrastructure severely damaged in different parts of the country. Rising water flow in rivers has broken the more than 100-year old record as the flood wave moves towards Sindh. Malakand Division of Khyber Pakhtunkhwa has been worst affected, closely followed by the districts of southern Punjab. In just five days, more than 1,300 people have lost their lives and the number is rapidly rising. Amidst all this crisis scene, Mr. President went ahead with his scheduled visit to France and UK in spite of widespread anger among country’s leadership about remarks by David Cameron, the British Prime Minister, accusing Pakistan of “looking both ways” on exporting terror. And while the rest of the citizens of the country are struggling to cope with the country’s worst flooding in 80 years, the Karachi city is literally burning. The murder of MQM leader and member of Sindh Assembly, Raza Haider, on Monday triggered violent tensions across Karachi claiming 73 lives till date and leaving around 150 people wounded. The Karachi city was already going through a dilemma named as ‘target killing’ and it seems that the death of Mr. Raza only proved to be the push of a finger on a weaken wall. With plane crash, floods, runaway leadership, ethnic clashes & killing, the thought of what awaits us next is something that disturbs my mind. 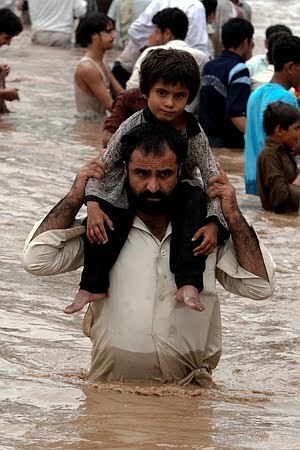 A Pakistani villager with his daughter moves wades to safety. 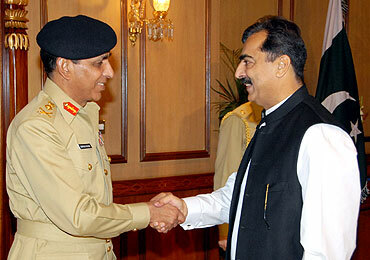 Prime Minister Yousaf Raza Gilani announced on Thursday that General Ashfaq Parvez Kayani will be military chief till 2013. PM made the announcement in a three-minute televised address to the nation in which he showered praise on Kayani and termed him a respected person both nationally and internationally. 2013 is also the year both the incumbent government as well as Chief Justice of Pakistan Iftikhar Muhammad Chaudhry’s tenures end. In March, the government had also given a one-year extension to Inter-Services Intelligence (ISI) chief Lt Gen. Ahmed Shuja Pasha for similar reasons. Kayani, arguably Pakistan’s most powerful man, had been due to retire in November. He had replaced former president General Pervez Musharraf on November 29, 2007. Before that, Kayani has also held the key position of ISI chief. He also officiated as the director general of military operations and held that slot when the Pakistan Army first moved into the country’s tribal areas to flush out al Qaeda affiliates. 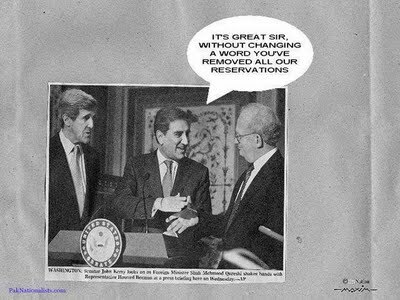 Kayani was also the man who reportedly brokered a power-sharing deal between Musharraf and slain former premier Benazir Bhutto – an accord that led to the issuance of the controversial National Reconciliation Ordinance (NRO) in October 2007. After years of demands and complains of the Pakhtoons, Pakistan’s Northwest Frontier Province is officially renamed as Khyber Pakhtoonkhwa, when the Parliamentary Committee on Constitutional Reforms (PCCR) signed the draft of the 18th Amendment in the first week of April 2010.The British rulers named NWFP- North Western Frontier Province, commonly as Sarhad in Urdu, for convenience after they had brought certain areas in the north-western part of their empire together as a single administrative unit. However, the name NWFP has not been acceptable to the Pushto-speaking Pakhtoons — who compose a substantial majority (about 58 per cent) of its population. People of NWFP are demanding to change the name of their province because NWFP is not a name, it is a location. Pakhtoons are in the majority in this province so they demand ethnic names such as Pakhtoonkhwa, Pashtoonistan or Afghania, whereas other ethnic factions like Hazarwals and others strongly reject these names. According to statistics by NWFP government, 68% of people in the province speak Pashto. Other languages spoken are Hindko(18%), Seraiki(8%), Urdu & Punjabi(2%). It is clear from the statistics that majority of the people speak Pashto. Hence the argument is not valid that since there are different ethnic groups in the region who speak Hindko, Seraiki, Chitrali, Urdu and Punjabi, the name of the province should not be changed to Pakhtoonkhwa. Awami National Party (ANP) have long campaigned for the change to Pakhtoonkhwa and put forward the demand that since all other provinces in Pakistan have ethnolinguistic names, Sindh, Punjab and Balochistan; so it is very fair for NWFP to change its name to Pakhtoonkhwa. The issue was raised by ANP leader, late Bacha Khan with former President General Ziaul Haq, who had offered to give a name to the nameless province, but later on Zia did not accept any of the names proposed because the names were being politicized by Afghanistan. Hence the issue became controversial which compelled ANP to abandon negotiations with then martial law administrator.ANP which currently rules the NWFP province is supporting government of PPP in center on all issues on the condition that PPP would support them to change the name of NWFP to Pakhtoonkhwa. The present government raised this issue in the parliament and opposition was faced by one of the major political party in the country, PML (N) who claimed that the new title could marginalize other ethnic groups in the province and they could lose their identity. However, renaming a province is not an easy procedure as it might seem to be since the renaming is not acceptable to the non-pashtoon population. Ever since the province has been renamed, a number of protests have been witnessed across the Hazara region, where Hindko speakers are dominant as compared to the Pashto speakers. The protests have led to death and casualties in the region which has added fuel to the fire. 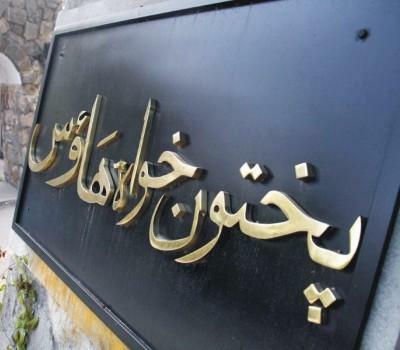 Local population has condemned the renaming of the province as Khyber-Pakhtoonkhwa as it wiped out the identity of the people of Hazara and demanded of the government to declare Hazara as a province. 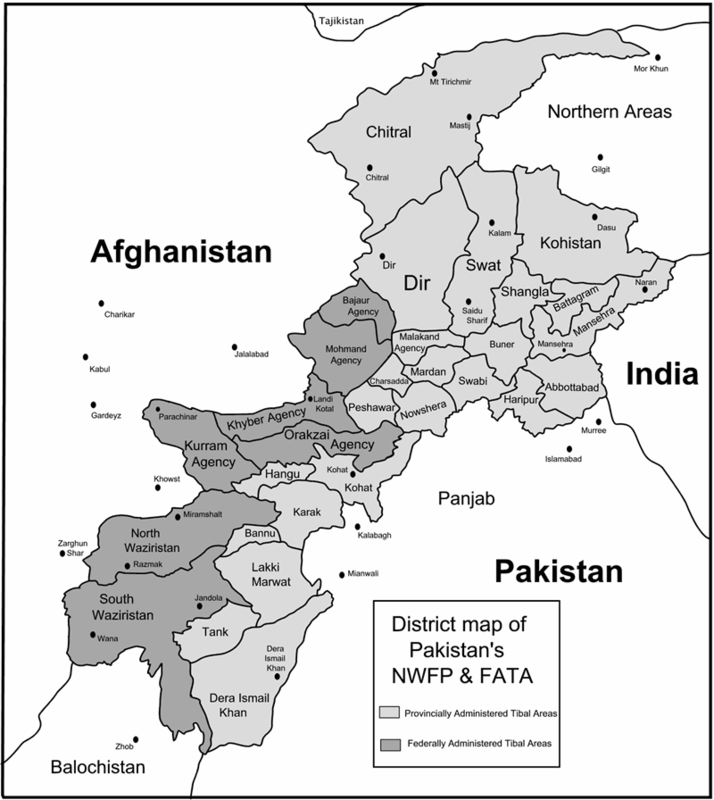 NWFP now known as Khyber Pakhtooonkhwa province has total 7 districts and Hazara is one of its seven divisions. Five districts make up Hazara; these are Abbottabad, Battagram, Haripur, Kohistan and Mansehra. Hazara Division is located along the famous Karakoram Highway and is bordered by the Indus River in the West, and Azad Jammu Kashmir in the East. Until the year 2000, the region was an administrative subdivision of the province known as Hazara Division, headquartered at the city of Abbottabad and Hazara Division was the biggest division of N.W.F.P. until the divisions were abolished in 2000 as part of an administrative shake up. Hazara has the major industry of NWFP, including Telephone Industries of Pakistan, Hattar Industrial state. This region is famous for Tarbela Dam Haripur, Kakul military academy Abbottabad, tea plantation and best grade tobacco of Pakistan, in Mansehra. Karakoram highway also passes through Hazara, while not through rest of Khyber Pakhtoonkhwa. It is evident that this division is definitely an asset of the Khyber-Pakhtoonkhwa region and both the pakhtoon and non-pakhtoon realize this fact. This is the main reason that Hazara people are struggling for their rights and demanding a separate province so that they can prove their worth. Hazara people believe that the way ANP has persuade it way to the name Khyber-Pakhtoonkhwa has triggered massive protests throughout the Hazara division and even the majority Pashtun population is acknowledging that Hazara should also get the identification. Some people are of the view that since the past of Awami National Party was anti-Pakistan, this is the reason they are planning to divide the country and people. Some locals argue that he name of Sindh province is because river Sindh flows through it and its civilization generated from it. Punjab is named because of five rivers flowing through the province. Hence Punabi or Sindhi is not a nation as ANP is lying to the nation. The local leaders believe that Khyber-Pakhtoonkhwa is not a fair name and it should be changed immediately and the new name should be above the ethnic differences. Two simple solutions to this serious issue could be to change back the name of Khyber-Pakhtoonkhwa to NWFP or to accept the demands of non-pakhtoons and claim Hazara division as a separate province. However the creation of a new province can trigger new debates in the country as the other divisions of the country can also initiate demands of new provinces. Therefore, our attention should be focused on real issues such as water, power and gas crisis rather than getting into the controversy of claiming new provinces. This issue calls for an immediate discussion by the politicians. A referendum most probably would be the best option in this regard so that the local people would feel their importance under a democratic government and would calm down slowly. It is assumed that Pakistan army and Pakistan government are inter-related or as if army works as one of the government institutions. The main reason behind this assumption is that much of Pakistan’s history has been marked with dictatorship. From self-proclaimed Field Marshall, General Ayub Khan to the so called Chief Executive, General Pervez Musharaf, the total span of military rule in Pakistan is more than 30 years. Such long military rules in Pakistan have left a deep impact on the minds of the common people who now they have started to look upon army for hope, whenever something goes wrong with the civilian government. There is now a common perception among people who the civilian government cannot work properly without the intervention of the army in government affairs. This is why most of the people consider Chief of Army Staff as the most dominant personality in Pakistan rather than the President or Prime Minister who is the head of the state. Part of the reason of this perception of the people is that have lost faith in the politicians and their unfulfilled promises. Whenever a new government is elected, people are made to believe by their elected representatives that things are going to change now and they will witness a brilliant future but all in vain. As soon as the new government takes an oath in the parliament, they turn into corrupt and self-serving officials who can no longer hear the hue and cry of the people. Ever since the independence of Pakistan in 1947, the civilian government has failed to live up to the expectations of its people and the public outcry for democracy, accountability, and social justice is simply ignored by the government. However, the government argues that democracy has never been given a fair chance to take root in the country’s political soil because of army interference in politics, but it is up to the politicians to act responsibly in order to win back the trust of the people. But the solution certainly does not lie in army takeover of the government every now and then, besides it has been observed that years of military rule have not made the system any better in Pakistan. In fact people are so tired of the situation that when they want army rule, it is only because they want an escape from the indifferent elected government and as soon as the army takes over people want their own elected representatives. What we need to do is to draw a clear line and re-define the powers and responsibilities of the government organizations and armed forces. Both government and army should act sensibly, respect each other’s rights and should regard the constitution as the highest authority of the state. One easier way to find our way out of this multidimensional crisis is to place the interest of the state on top priority instead of our personal interests. On Oct. 15th President Barack Obama signed the bill into law which will triple non-military US aid to Pakistan to $7.5 billion over the next five years and hence leaving no choice for Pakistan government to request for any amendments in the bill. The only choice before us is to either fully accept it or reject it on the whole.